Tomorrow, tickets go on sale for our friends Secret Cinema ‘s latest venture – William Shakespeare’s Romeo + Juliet. 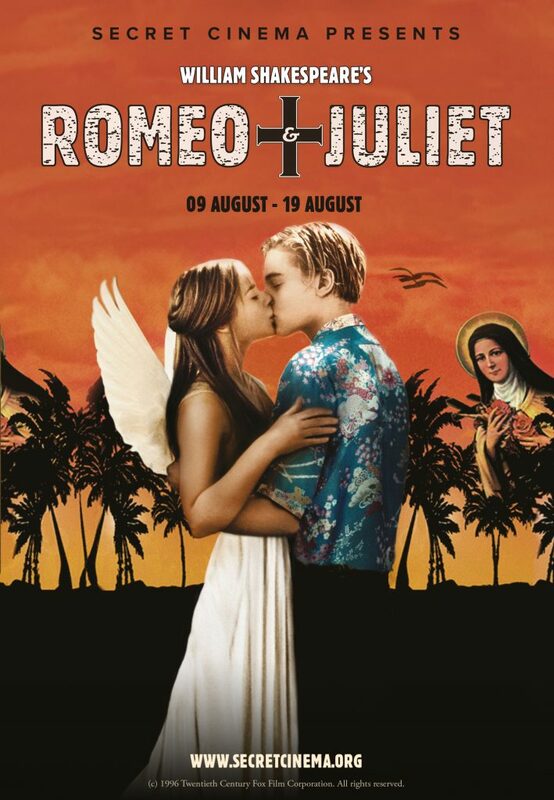 This latest immersive film experience which will bring to life Baz Luhrmann’s adaptation of the classic Shakespearean love tragedy Romeo and Juliet sounds simply unmissable. The summer festival will run from August 9th – 19th 2018 and tickets go on sale at 12pm (BST) on Friday 18th May. Tickets are available at www.secretcinema.org with prices starting at £49 plus booking fees. Show nights are Wednesday to Sunday. A secret outdoor London location and will be transformed into a spectacular multi-layered world of Verona Beach. This open-air production will be the largest experience Secret Cinema has ever produced, bringing together live bands, DJs, choirs and artists together with an audience of almost 5,000 people taking part in the show every night and up to 50,000 in total over the two weeks. Secret Cinema Presents William Shakespeare’s Romeo + Juliet will be set against the themes of peace, redemption and salvation, and young hearts of Verona will be summoned to the city on behalf of the brave and noble Captain Prince. All are called to create a truce between the warring houses of Montague and Capulet, all must come to crush a cup of wine in peace. Secret Cinema Presents William Shakespeare’s Romeo + Juliet tickets will go on sale Friday 18th May at 12pm. Prices start at £49 plus booking fees. Full details and tickets can be found at www.secretcinema.org. Follow the story across social media using the hashtags #YoungHearts and #SecretSummer.